These delicious Christmas stocking cookies will be the highlight of your Christmas dessert table. The meringue cookies are brimming with the flavors of cream cheese and cranberries and are so pretty and festive. I love the texture of meringue cookies. They have a melt in your mouth thing going on that is very appealing, but are naturally low in calories, since you use egg whites and not whole eggs to make them. The base of the cookies are light and fluffy meringues – just perfect after the extra food that is consumed in your Christmas dinner. They are both tangy and sweet and your guests will love them. 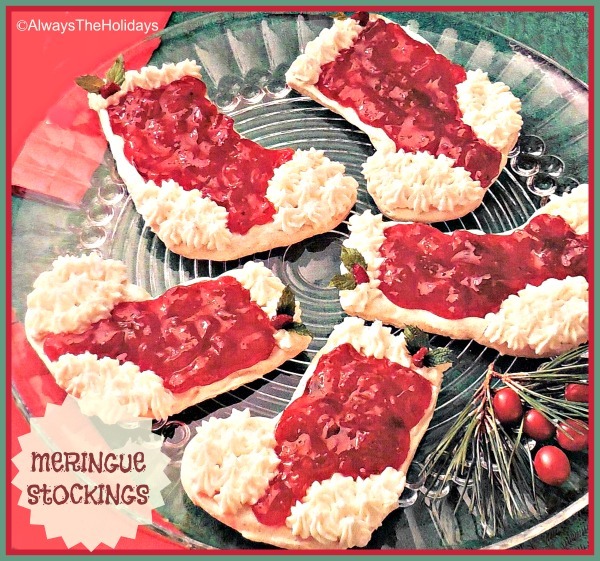 The cookies have a delightful Christmas stocking design that is super easy to make. Just add the cream cheese icing to a pastry bag fitted with a star tip and pipe the top of the stock and toe and heel areas with the icing. Then spread the cranberry filling in the center of the stockings. A couple of mint leaves and a half cranberry gives the holly berry design to the top corner that completes the design. So pretty! Preheat the oven to 300 º F.
Place the egg whites in a mixing bow and bring to room temperature. Add the cream of tartar and beat until soft peaks form. Gradually add the sugar, just a bit at a time and beat on high speed until stiff peaks form. Spoon onto parchment paper in 16 mounds. Shape into a 4 1/2 inch stocking shape. Remove and cool on the baking sheets. When completely cooled, remove and store in an air tight container at room temp until ready to decorate. Combine the sugar, cornstarch and cranberry juice in a saucepan. Stir in the cranberries and bring to a boil. Cook, stirring for 2 minutes. Reduce heat and cook until the berries pop - about 5 minutes. Mash the mixture and allow it to cool. Beat the cream cheese, confectioners' sugar and vanilla extract. Fold in the whipped cream. Spoon the mixture into a pastry bag fitted with a star tip. Pipe the top of the stockings and the heel and toe areas. Spread the cranberry filling into the center of the stockings. Garnish with two mint leaves and one half cranberry for the holly decoration.